​Diederik Van Rooijen’s The Possession of Hannah Grace was advertised in a way that made audiences believe that maybe movie-goers might be in store for a different kind of possession horror film, with a heavy focus on what happens to the human body after an exorcism is performed. With the expectations of something fresh and new, it’s discouraging to see the film fall short in several ways. ​Granted, a solid horror film is hard to come by these days. And, not all possession films can live up to The Exorcist, or even the goofball horror cult classic Evil Dead (including its much darker and intense 2013 remake.) However, the shortcomings of Rooijen’s film seemed to be caused by amateur storytelling. We have the cliché female protagonist portrayed by Shay Mitchell, the isolated hospital setting (which let’s face it, isn’t realistic,) and a few cheap jump scares that leave audience members with roughly an hour and forty-five minutes of yet another sub-par horror film. ​Taking place in Boston, The Possession of Hannah Grace follows the stereotypical ‘damaged’ female lead who takes a job as an overnight intake administrator for a hospital morgue. Like most unoriginal storytelling, the beginnings of a possible haunting are confused as hallucinations and easily dismissed as Mitchell’s character Megan seems too enthusiastic to become situated in her new position. With most films where the main character is in isolation, it’s a difficult task to introduce other characters that can exhibit the ability to show any depth, as well as create any connection with the audience members. So when they’re offed, nobody seems to care. ​I will say, some horror films take time to build some momentum, but The Possession of Hannah Grace started with a fast pace, and was able to maintain that throughout the film, so I tip my hat in that aspect. However, no matter the pacing – it all leads up to the inevitable and predictable ending, which I won’t ruin in case you find yourself still interested in giving the film a shot. ​Keep in mind, not all decent horror films need to be attached to BlumhouseProductions (although it doesn’t hurt.) Remember Ari Aster’s Hereditary earlier this year, that was a surprising horror film that left audiences disturbed yet somewhat satisfied. 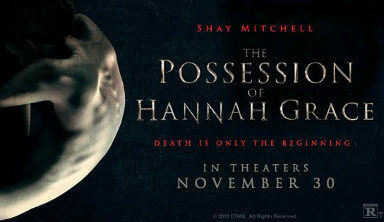 ​Overall, I’d give The Possession of Hannah Grace a D+.